The commonly perpetuated view of Vikings and their weapons being simplistic, utilitarian, and plain is instantly disproved by this 11th Century Viking Sword with Scabbard, which is ornate and intricate in its design, as well as hardy and strong. This beautiful blade is modeled after a Viking sword of the 11th century that was found on an archaeological dig in Finland and is now displayed in a museum in Helsinki. The blade is dual hardened and forged from 5160 high carbon steel. It features a gradual profile taper, which provides an effective cutting edge and a sharp yet broad point for stabbing attacks. The deep fuller on the blade is also a classic element of Viking sword design. The narrow guard and distinctive pommel are both crafted in cast bronze and richly detailed with Viking knotwork, depicting dragons and various other designs that make this sword truly stand out as a work of historical art. The grip, designed for one-handed use, is built around the swords full-length tang and is peened at the pommel. It consists of wood and leather wrappings for a comfortable hold. A matching wood scabbard with leather wrapping is included with the sword. No sword belt is included, so you can attach the scabbard to your own favorite sword belt in your preferred carrying style. Of course, this sword is no shelf sitter but instead is a fully functional sword, so much so that you can take this 11th Century Viking Sword with Scabbard off the rack and use it for cutting, fighting, training, and more, all without having to worry too much about harming the stunning designs on its fittings. Please be aware that this sword is hand forged, and as such, its finish and overall measurements can vary slightly from what is shown here. 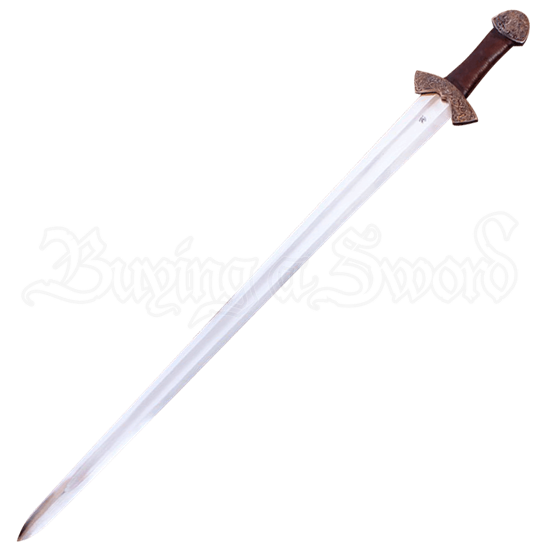 Also be aware that this sword is made to be practical, tough, and hardy, and its finish, being hammered and hand forged, can sometimes feature marks from the forging process.